These are medicine rattles used to connect to the spirit world and are constructed from rawhide, rocks, eagle feathers and magpie feathers. It was the power that these birds possessed that was given to a person like a medicine man. These medicine rattles used spirituality to heal our people. 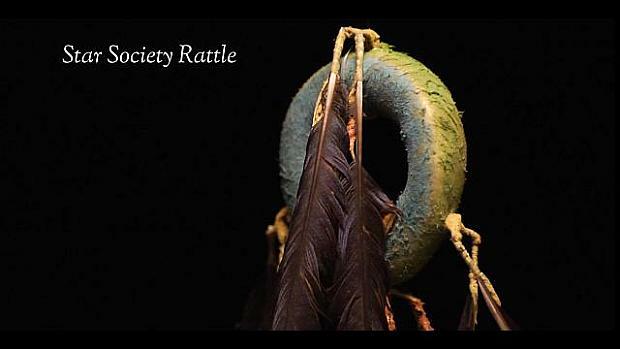 The Star Society Rattle was used in certain songs. The sound represents rain. When the Europeans visited, came and stayed on this continent, at that point in time, slavery was prevalent. European visitors would capture young men and take them overseas where they were sold and used as slaves. Eventually, they devised a way to escape. They would travel at night under stars. The stars and constellations guided them back to our people. During the day, they would stay concealed and would stay in places like caves. Eventually they made it back. The people were happy and there was a celebration. When they were asked how they made their way back, they explained that they used the stars to bring them back home. Therefore, they were called the Star Society.